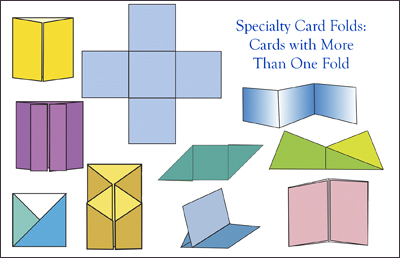 Tri-Fold Cards (including Slanted Panel, Stepped Panel and Angled Panel variations). I did this eArticle a little differently than you might expect. 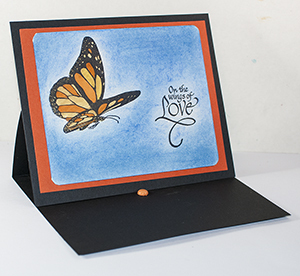 Usually card construction tutorials show you how to create a specific card size and shape. This is great if that is exactly the size and shape you are after, but what if you need to change it up a bit? Maybe instead of 5 1/2″ x 4 1/4″, you want it to be 4″ x 6″. Or maybe you want it to be a square card. Or you want it to be a non-square card? How do you adjust the measurements so that a particular card still works? In this eArticle, we explore how different cards work so you really understand their requirements. After most of the eArticle’s card sections, I include a chart with sample card sizes and the cut and fold measurements you’ll need for each. This makes it very flexible to create exactly the card you want. I don’t list every possible size. (That would be endless and impossible.) 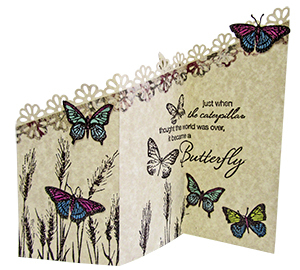 But I list enough that you can see the pattern on how you would need to adjust the measurements to create that card in a different card size. I’ll admit that figuring this stuff out tied my brain in knots in a few cases, but figuring it out is worth while and should save you some trouble! Another wonderful source of information for card crafters. Thanks to you and all the sponsors. I have it saved on my computer now.